Shanghai is a new city compared to other Chinese cities. It is only 200 plus years old. So there is not much of Chinese history here but it can be thought as a barometer of how far China has come in the last decade. I have been told that China has progressed in the last 6 years what it took the west 16 years. I can not vouch for that but I can say Shanghai is moving fast getting ready for its really big show in 2010, the World Expo. Shanghai thinks of itself as China’s premier city, not Beijing. So expect the World Expo to be somewhat more spectator than the 2008 Beijing Olympics. We comfortably settled into Shanghai ready to experience some modern Chinese urban living in our corner apartment in a trendy section of the city thats called the French concession. The neighborhood streets are lined with Sycamore trees. On one of our corners was a subway stop , another corner had a Chinese convenient store, another corner had a cluster stores including a fruit market, DVD store, couple of restaurants and bars with sidewalk sitting, a dry cleaners and a couple small clothing shops, the other corner had a small park and up the road from it were more restaurants including a Star bucks with sidewalk sitting. Everything was handy so to celebrate the end our day of traveling we purchased something in the convenient store something we haven’t seen in 5 weeks, pizza. What a way to start a new adventure, nice place, good neighborhood, tasty food, and Hongxuan was arriving the next morning to visit Shanghai with us. SHANGHAIED……The pizza came right back up the next morning and all of that day. Ann and Hongxuan toured the town and I puked all day in our cozy apartment. Travelers rule #1: only eat it, if you can peel it, boil it, or overcook it. We did peel the cellophane off the pizza we saw sitting on the store shelf. On day two I was done with the regurgitating but felt weak, but able to see Hongxuan to the train station that night because we needed to purchase our highly anticipated overnight sleeper train departure to Hong Kong, and Hongxuan would be a valuable asset in the negotiation of the ticket. Standing in line at the English window at a very busy and crowded ticket section of the station, some officer blows a whistle and half the room starts running away and disappears around the corner, including Hongxuan. Ann and I look at each other and notice some people are still hanging around so it can not be life threatening and maybe Hongxuan will return when she notices we aren’t with her. She comes back to help with the ticket……..
SHANGHAIED….No more sleeper compartments available. This the first connection miss in 2 months. Back at the apartment that night, how did people travel without the internet, we got busy on the internet and got confirmed on a flight out and a room at the Hong Kong airport. Every things back to being great, I am feeling better, we got connection to Hong Kong…. SHANGHAIED…..Ann wakes up in the middle of the night with the Shanghai revenge. Okay fours day pass and finally we are both ready for some modern Chinese urban living. We walked the pedestrian only Nanjing street on Xmas eve buying a few necessities and at night rode the pedestrian trolley up the lit street with sounds of different Xmas songs passing in the night. It was one of those moments we both said “Do you believe we are in China”. The weather got colder the next days, but we made it to the Bund, and wandered around the French concession dreaming of the warmer weather of Thailand coming next. We discovered at the subway corner of our neighborhood the mobile version of Amazon.com. A man had a couple cardboard boxes of paperback books hitched to a platform on his bike. All not yet published paperback issues of best sellers, except at this corner. Ann made a sidewalk purchase of Dans Brown’s latest novel, in paperback, only in China for $3.50. Our departure date came much to soon but we left Shanghai feeling good that warmer weather is coming next so we arrived at the airport smiling …. 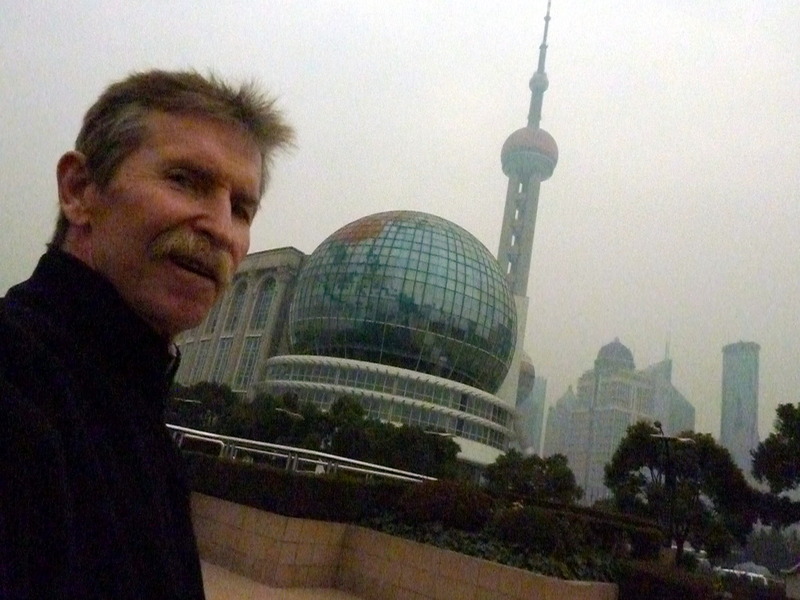 SHANGHAIED…..the check in attendant told us that our flight reservations have been canceled by our booking agent. We called them and they said they had not processed the taxes yet so the tickets have not been finalized yet, even though we had a confirmation letter from them that they had reserved our seats. They agreed to rebook our flight at a higher price, but we declined for fear of their incompetence. We booked with the airline at a higher rate hoping this would be the last time we are Shanghaied. 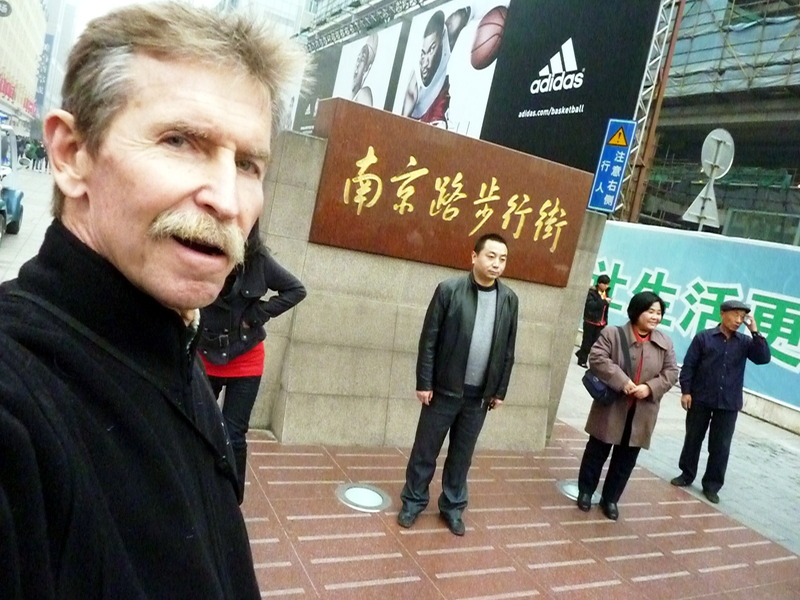 George and Ann — glad you are feeling better, and that you got to see some Shanghai before moving forward. Guess by this time, you have already celebrated New Year in Hong Kong. Hope the fireworks were spectacular. Ann & George – I like the way you are able to work your way through the neighborhoods, almost getting lost, or getting unlost, and still end up enjoying yourselves. We’ve developed a habitat of doing the same. When you get to Europe, we can give you tips about places to check out. Esp. Italy. Just what you need, huh? By then you will be so experienced with the ways of the world that outside advice will be superfluous. Will keep an eye on your site for your proximity. Snowing hard and about 25 degrees in downtwon Albany.